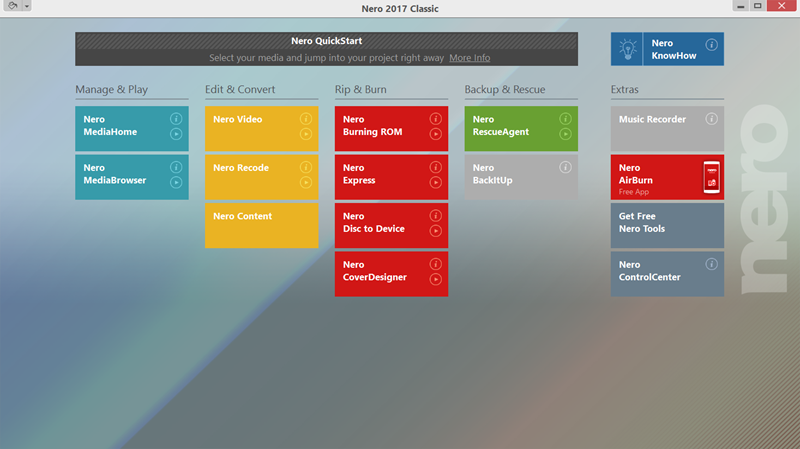 Nero 2015 Classic is the award-winning suite to burn, rip, convert and manage all your videos and music to discs, TVs, smartphones and tablets. And with our new apps, you can master your multimedia, burn over the air and improve your Nero skills, too. It includes the easy-to-use video editing software Nero Video which will transform any home movie into a Hollywood blockbuster with excellent film effects and allows you to burn your files to CD, DVD and Blu-ray disc with the world's best burning engine. Superior disc and file playback is built-in as well as streaming of virtually any file to your iOS devices, Android devices and all compatible Smart TVs. - Dependable streaming support for all your devices including TV, tablet, smartphone, console or home media player. This page was last modified on 2 September 2015, at 09:51.